After the Anglo-Irish Treaty of 1922, there were many fears and anxieties for both Catholics and Protestants over what the state of Northern Ireland would be. They both felt that they were living in a country with their enemies. Protestants abolished any sort of power Catholics had in the government through gerrymandering and abolishing Proportional Representation when they gained control of the government. 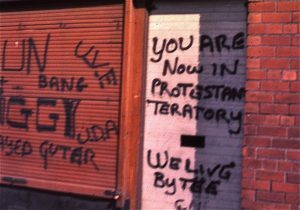 They wanted to take their power away because they felt that the Catholics wanted a United Ireland and would work towards that goal, which they did not want. They wanted to stay as a part of the United Kingdom because they saw themselves as British not Irish. Ian Paisley, leader of extremists Protestants that were against the Catholics, gave many speeches to his people instilling their fear of the other religion. He said “Protect us from the shackles of priestcraft.” This quote shows the type of fear he was making the people feel. He stopped Protestants from seeing Catholics as just people but made them see the Catholics as always out to get them and against their country. 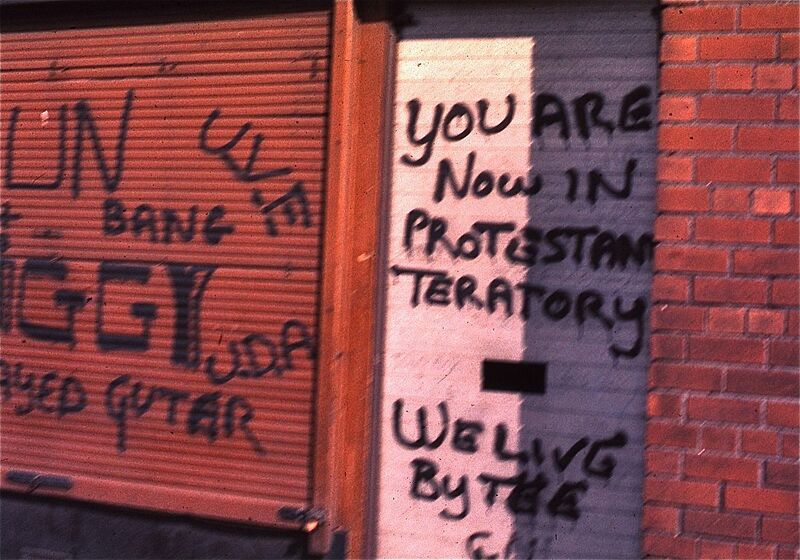 Graffiti in Belfast that shows the separation of territory between the two groups. Meanwhile the Catholics where the minority in a country of people who looked down on them. The Catholics knew they were being barred from the government but there was nothing they could do. Being barred from jobs, new houses, as well as having the government and police against them made them unsure of their own and their families futures. In the book That’s That, the main character Colin and his friends are caught smoking weed by the cops and because of how they were raised they all instantly started giving the English cops wrong names, addresses, etc. This shows that they had no trust for the cops, they were not lying because they were caught doing something illegal; they were doing “just as they had been taught to do.” Before the Troubles started an economic downturn took place because the industries in Northern Ireland were beginning to become outdated. This recession caused mass unemployment and led to tensions between the two groups because they were fighting for jobs and Protestants thought the Catholics were trying to steal their jobs. This tension eventually boiled over and started the Troubles.